BAGINTON - Everyone to be IN the squadron at 0920hrs. We shall finish back at the Sqn at 1230hrs (normal time). Parents are welcome to attend the church service at Baginton, but as parking is limited at the church cars should be left at the Squadron. COVENTRY - Mustering on Spencer Avenue (near Spencer Park), to arrive between 0945hrs and 1000hrs. You will be aware that road closures are in place for the parade, so routes to the muster point may be convoluted, and busy with other parents! The parade is expected to finish and disperse by 1200hrs. DRESS: Uniform is No2 (Wedgewood blues and jerseys) for cadets, No1's for uniformed staff. WEAR WARM BASE LAYERS! 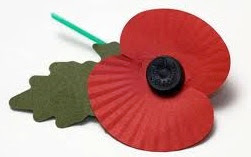 Everyone is to bring their own poppy and church offering.